For the second time in less than a month, I am in "Facebook Jail," apparently because pro-police trolls have reported certain blog posts about my wife Carol's broken arm (courtesy of Missouri cops) as "spam" and "unsafe." 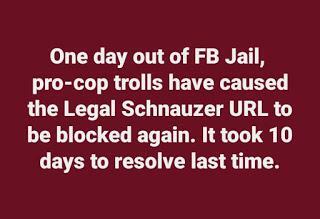 The bogus spam complaints have caused Facebook to block the Legal Schnauzer URL, meaning those who follow me on Facebook cannot go via a link directly to the blog. When this happened last month, it took about 10 days to resolve. It looks like it will take 10 days or more to resolve it this time. That is irritating to me and my readers -- and one reader had an idea that just might put a stop to it. The reader suggested that I sue Facebook. At first, I laughed that idea off. If I was able to secure the services of a lawyer who wanted to take on the social-media giant, that might be one thing. But for me to do it myself, on a pro se basis? Well, that seemed like a Quixotical task, given the way courts love to cheat individuals who represent themselves. But I've decided the idea might have merit, with or without a lawyer. For one, I've repeatedly explained to Facebook that my posts are not spam, and they are tied to a secure URL, so they aren't "unsafe" either. I've encouraged the company to eye the trolls who are causing the problem and punish them, perhaps by throwing them in Facebook Jail. Those entreaties seem to have fallen on deaf ears, which could lead to a valid legal claim against Facebook -- perhaps for negligence, wantonness, or more. We have not gotten, however, to what might be the good part. Part of a lawsuit against Facebook could be, via discovery, to force the company to turn over the names of trolls who are causing this malicious action against me. With the names of the trolls in hand, I could add them to the lawsuit and try to hit them where it hurts -- in the pocketbook. If Missouri cops or their associates are behind this -- and I have little doubt they are -- taking a big chunk out of their paychecks might be quite a treat indeed. The trolls could be hit for tortious interference, for sure, and perhaps other claims. If it's proven that cops are using public resources (computers, phones, etc.) for their own personal amusement (to facilitate harassment of a blogger), it could lead to an investigation on possible violations of ethics law -- and it could cost several coppers their jobs. A lawsuit might be a way to drop some serious hell on the heads of thug cops who deserve to be outed and punished. The more I think about it, the more I like it.